What do Greenaway and Dubois mean? Greenaway laments the passing of the classical narrative film-going experience, where we, the audience, sit in a darkened movie theater and have a movie wash over us as passive recipients of a director’s (or studio’s) vision. Dubois, on the other hand, celebrates the fact that there is now more visual storytelling in the world than ever before and that we, the people, can actively watch and/or participate in all of it as much, or as little, as we choose. They’re both right. And where do we go from here? Well, it is probably best not to make predictions about the trends of one’s own era, as present-day context clouds our judgement. Still, it is safe to say that in this second decade of the 21st century, we are experiencing a moment where the amount of moving-image media to which we have easy access is enormous, growing almost exponentially. Distribution services that have but recently been invented, home-streaming services and portable devices among them, offer us a plethora of delightful cinematic delights. As a result, there is a self-reinforcing cycle of less and less production for theatrical release, particularly of the non-blockbuster variety. Why go out to the movies to see smartly written dramas or comedies that don’t cry out for IMAX or Dolby if you can watch them on your own personal 52-inch flat-screen TV? I love the magic of a movie theater, where I lose myself in the story that surrounds me. I find my attention gripped in a way that it never is at home, the beams of light from the projection booth piercing the dark and lighting my dreams on fire. I, too, like Greenaway, am saddened by the rapidly dwindling prominence of this experience, even if, like Dubois, I celebrate the creative vibrancy of cinema’s new forms. Wherever one falls in one’s own viewing habits – and I partake equally of home options, lack of magic notwithstanding – we can all hopefully agree that the passing of history is worth noting. Humans have always abandoned old technologies for new, but in the moment of transition we feel a deep nostalgia for what is lost. Fortunately, if one loves movies as much as I do, there is an exhibit of photographs on display in Baltimore that showcases the glory of our cinemas, past and present. Baltimore Sun staff photographer Amy Davis, drawing from Flickering Treasures, her beautiful hardcover retrospective of Baltimore movie houses, presents 19 large-format prints and one compilation video in “Home Movies: Portraits of Baltimore’s Neighborhood Movie Houses,” now at Gallery CA (first floor of City Arts Apartments, 400 E. Oliver St.), through December 15. Not only are these “treasures” well worth discovering, but so is the building that houses them. 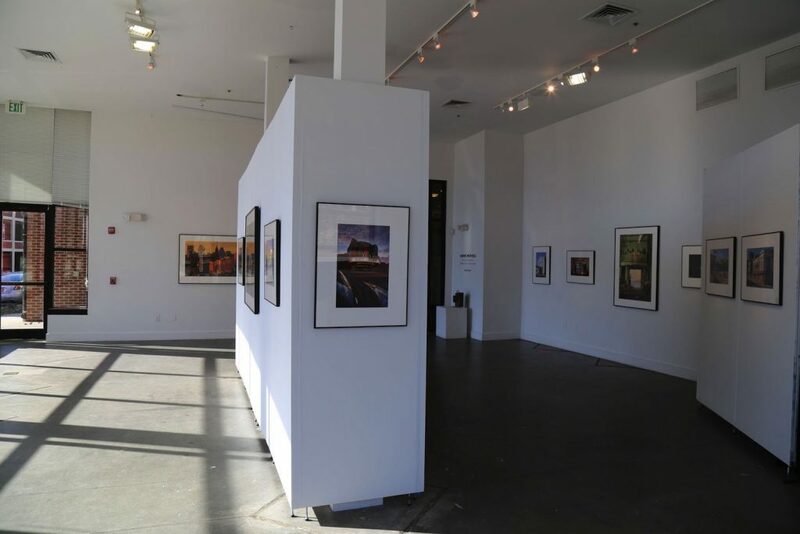 Open since 2011 (on a spot once home to the Social Security building), Gallery CA, according to manager Quentin Gibeau, hosts a variety of exhibits by local, national and international artists. I strongly encourage all reading this to head on down and support a brilliant local artist. Davis, who has been at The Sun since 1987, has compiled quite the testament to communal moviegoing. 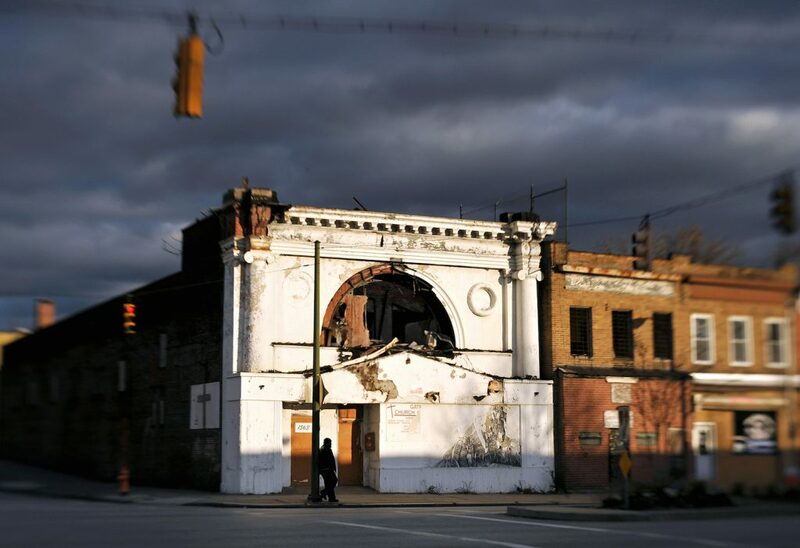 From the heyday of 119 open theaters – in 1950s-era Baltimore – to the mere 5 theaters that remain today, she chronicles the history of 72 profiled buildings’ trajectories from their early days to their destruction or transformation into something else to, in but a few cases, their survival as renovated version of themselves. Each series of photographs is accompanied by recollections of that particular theater from someone who knew it in its original form. Beyond this magnificent history, Flickering Treasures is more than a book about movies, or even about Baltimore; it is about the human experience. I spoke on the phone, and exchanged emails, with Davis about the book and exhibit. Here is that conversation. Why publish this book now? How long did it take you from conception to completion? Why put these 72 theatres in the book, as opposed to others? It took nine years to get it right. 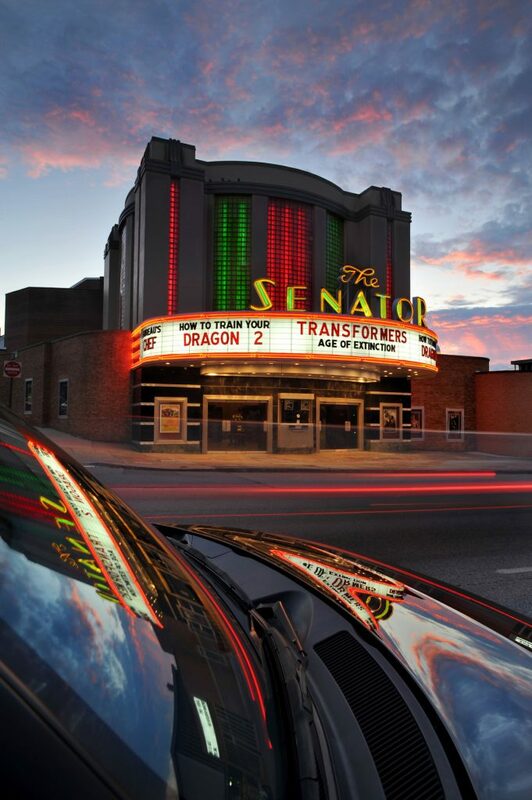 My concern in 2007 about the fate of my struggling neighborhood theater, the Senator, sparked my curiosity about what had become of all the other neighborhood theaters in Baltimore. By early 2008 I was hooked on the subject and decided to do a book. My initial goal was to include 50 theaters, but as I plunged into the research, the number of theaters of interest expanded to more than 86. The theaters selected had to meet three criteria: compelling images, reminiscences with emotional wallop and informative detail, and historic significance. 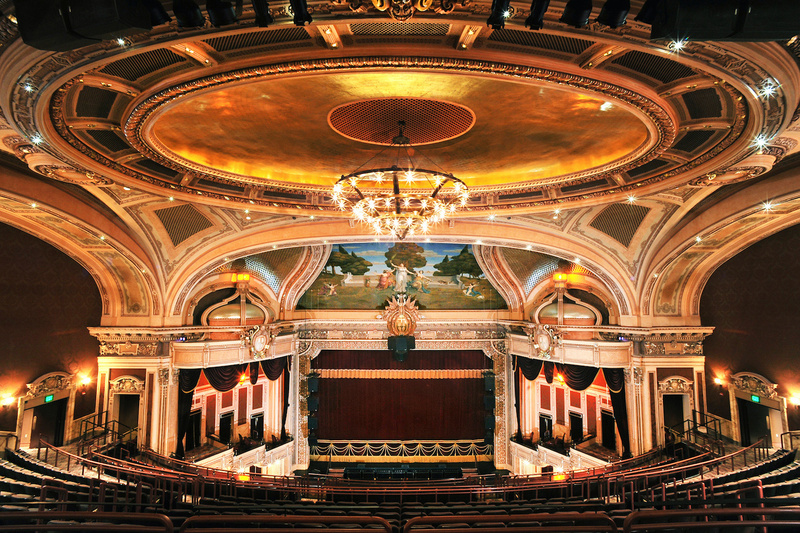 Each theater illuminates the narrative about the evolution of theater exhibition, and offers insights about the character of each neighborhood. Additional theaters that didn’t make the final cut, due to space considerations, will be introduced sporadically in my blog, “Outtakes,” on the book’s website, www.flickeringtreasures.com. How did you decide which photos to put in the exhibit? The images in “Home Movies” were chosen to spotlight the role of neighborhood theaters in the city, as opposed to the more familiar downtown theater “palaces.” Many will surprise visitors, because any clue about the original purpose of many of these structures has vanished. I was seeking an emotional range from forlorn and gritty to the glowing neon of the few survivors. I hope this book will spark a dialogue about ways in which some of these underutilized buildings – once communal anchors – might better serve their communities. In the preface to the book, you talk about how you used Lensbaby lenses to photograph the theaters. 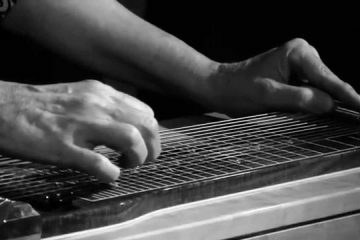 What are those, and how do they affect the images? I wanted to stretch myself creatively by working in a more impressionistic, fine art mode than the way I approach my photojournalistic work at The Sun. Lensbaby, a specialty lens, enables the photographer to emphasize select areas of the image by placing them in sharp focus, with surrounding areas rendered in varying degrees of a softer blur. 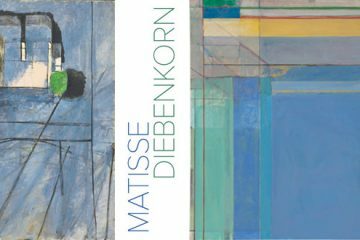 I hope this suggests an elasticity between past and present, so that either memory or imagination will propel the viewer to travel back and forth in time. The book presents each theater in its heyday first, so that the stark changes are often painful and sad. In the “Home Movies” video, I chose to present the contemporary color photos first, followed by the vintage B&W images, to provide additional context for gallery visitors. 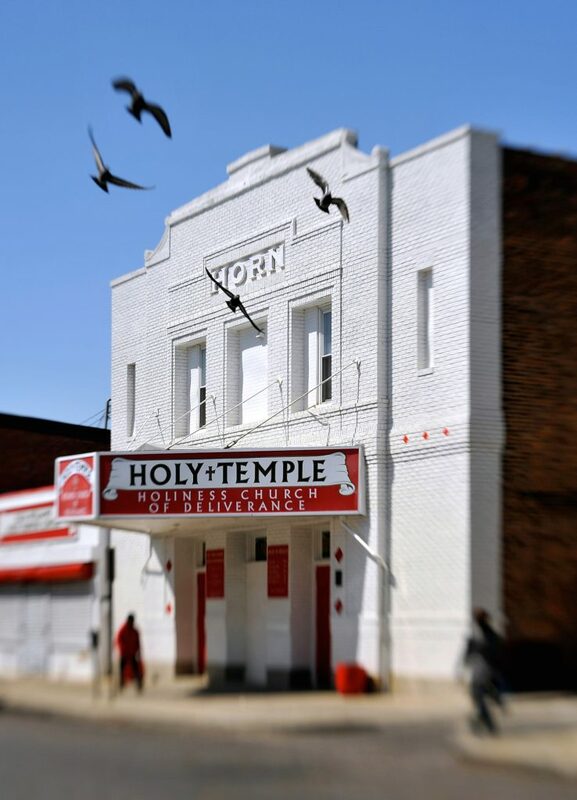 The video, edited by filmmaker Joe Tropea, also includes additional neighborhood movie houses that I did not have space to include in the exhibit. You’ve been at The Baltimore Sun since 1987. In that time, have any theaters closed that made you particularly sad? Most of the theaters in Flickering Treasures were closed before I came to Baltimore; and even more by the time I began the book. The Orpheum (1990 – 1999) was an enchanting revival house in Fells Point. It is fitting that this theater, which celebrated the essence of the communal movie experience, is the final entry in the book. 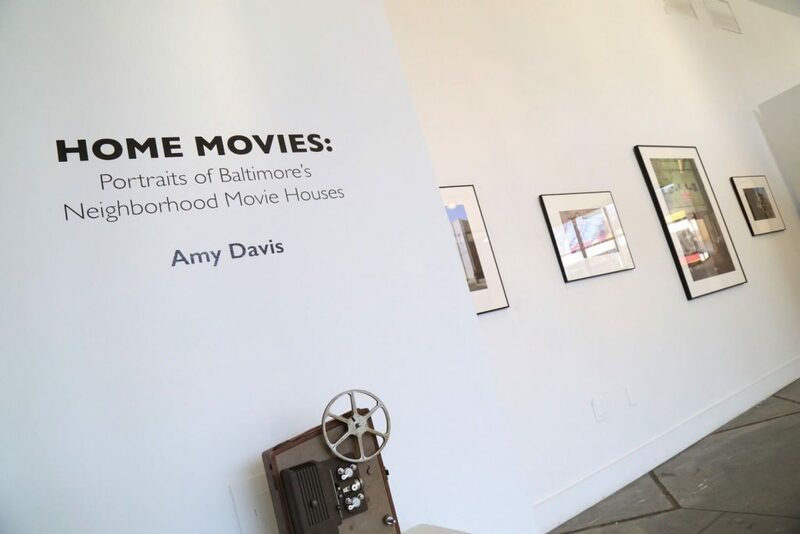 Home Movies: Portraits of Baltimore’s Neighborhood Movie Houses runs through December 15 at Gallery CA (first floor of City Arts Apartments, 400 E. Oliver St.). Hours are 12-4pm, Monday-Friday.